You’d plant the seeds – or perhaps just one, like a new, Piranesian “Jack and the Beanstalk” – do some watering, perhaps spread a little fertilizer… and at some point your own house will grow. But what then? Do you prune excess or unwanted rooms? Can you graft new floorplans into the tree’s genetic code? And will you get sap all over your FCUKing clothes? Instead of topiary gardens, rich feudal warlords of the somewhat immediate future, with coked-up guards patrolling razorwire perimeters holding AK-47s and driving stolen Humvees, will cultivate delicate architectural gardens full of intertwined Urpflanze Häusen, on well-watered terraces stretching off past the conflict-laden, desert horizon. The world’s eventual oldest living house will be planted by a fourteen year-old girl in the hills of Missouri, out-living the Anthropocene by uncountable hundreds of years. Hi! 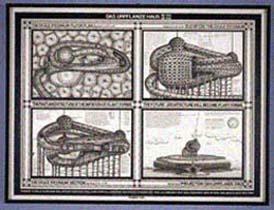 love your page – i noticed mention of Paul Laffoley’s Plant-architecture idea. I have osme larger versions of that image in the Paul Laffoley section on my site. He actually has many other ideas of equal insight and creativity.